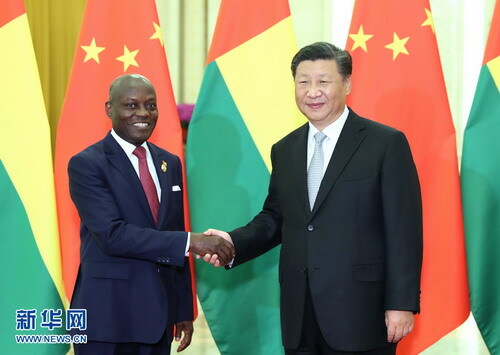 BEIJING, Sept. 5,Chinese President Xi Jinping on Wednesday met with Guinea-Bissau's President Jose Mario Vaz after the 2018 Beijing Summit of the Forum on China-Africa Cooperation (FOCAC). Xi expressed thanks to Vaz for his contribution to the success of the summit and spoke highly of his support for strengthening China-Africa cooperation and jointly building the Belt and Road. Peoples of the two countries forged profound friendships when Guinea-Bissau struggled for national independence and liberation, Xi said, adding China is glad to see recent positive progress in Guinea-Bissau's situation. China appreciates Guinea-Bissau's firm stance on the one-China policy, supports it in exploring a development path suited to national conditions, and respects its people's independent choice, Xi said. 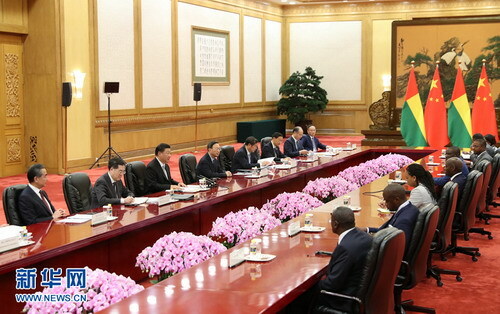 Xi said China will work with Guinea-Bissau to continue mutual support, expand agricultural and health and medical cooperation, and make full use of FOCAC and the Forum for Economic and Trade Cooperation between China and Portuguese-Speaking Countries in a bid to translate friendship into more cooperation outcomes. The Belt and Road Initiative creates fresh opportunities for China, especially central and western provinces and cities, to step up external exchanges, Xi said, adding the regions will be encouraged to strengthen cooperation with countries including Guinea-Bissau. Vaz said he appreciates China's consistent and precious support for Guinea-Bissau. During his visit to China, Vaz learned about rice cultivation from Academician Yuan Longping in Hunan Province, as China is helping the country achieve food self-sufficiency. He also visited Chongqing for the second time in 14 years and found a tremendous amount of new development in the city. Vaz said he admires China's development achievements and hopes Guinea-Bissau will develop like China. Guinea-Bissau is willing to use China's experience in governance and poverty reduction as a reference, and seize the opportunity of the summit to actively participate in the Belt and Road construction and expand cooperation with China.